Posted on September 27, 2011 October 29, 2011 by Tarleisio	This entry was posted in Uncategorized and tagged chypre, Dawn Spencer Hurwitz, Pandora. Bookmark the permalink. 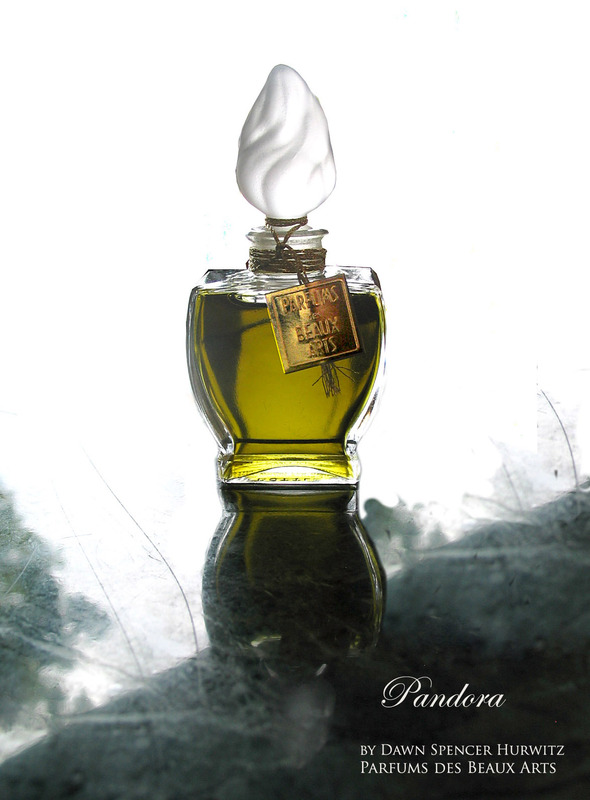 Perfume like this is an expression of the personality and character of the perfumer, in this case the beauty speaks for itself. I recently bought Pandora, after receiving a smaple. It truly is a lovely fragrance, very rich but very wearable. Cheers and hats off to Dawn! You had me sighing for that “newborn girl-woman” – how delightful, to find a scent love at that magical transformative time! A precious girl-woman lives at my house, too. I've tried to give her the opportunity to find her own beloved fragrances (which are not, of course, mine!). We'll have to see how that plays out; she's still exploring. Until this year, she's been dressing as if she were still 12, though she's 16. It's taken the interest of one very sweet boy to change that, and I'm watching her try some new waters. It's not that I want to push her toward womanhood too soon – but I want it to beckon her, rather than seem frightening. If gourmand scents and florals beckon, then I'll make those available for her! A sample of Pandora is coming to me soon. I'm looking forward to it. A beautiful writing – as always! I can hardly wait for my sample that I won in a draw to arrive – after all the wonderful words I read about this perfume. I'm so glad to see this getting such love, and I'm not surprised that you fell for it. From what I know of your tastes, it seems very you. But how sad about your sample! Hopefully some will come your way soon to replace.